1 - EN Where will you be on -21-24 / 08/ 2014? - FR Où serez vous les 21-24 aout? 2 - EN Wherever you will be, do you intend to visit /participate in WSF café Ottawa on those days? - FR Où que vous soyiez avez vous l'intention de participer au café FSM ces jours là? 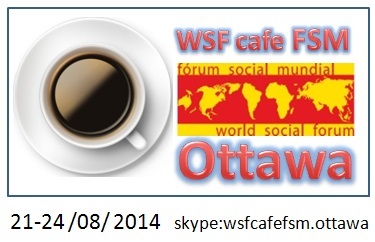 6-8/13/2014 09:00 I will not be in Ottawa, but Canadian insomniacs might find me participating in the WSFCafe. Prior to official opening on 21 August, I can assist remote participants acclimatize to Canadian Eastern time. chris Australia with prior WSF Cafe experience from Sarajevo-Extended. 8- 8/14/2014 17:38:40 I will not be in Ottawa, and may find a moment to connect on skype OUI JE POURRAIS BIEN et je fais des maintenant contact avec le compte skype "wsfcafefsm.ottawa" et PARTICIPERAI PEUT ETRE en ligne dans le cafe My name is imran, Afghanistan EN English communication possible I really like to participate in WSF. Because I attended alot of events and workshops and I got more experience from it specially in the place of youth. So like these I want to participate in this also and I am sure it will be very good for me. As you know that I am from afghanistan and currently i am here. So I cant participate directl. So I want to connect with you online. 2 - EN Ask questions, look for information about WSF - FR Poser des questions, chercher des informations sur le FSM REMOTE SKYPE HOST : run a chat room with several participants and be in contact with OTTAWA SKYPE GUESTS, type some interpretation Nil Very good! / Très bien! Participation à la caravane de l'Afrique de l'ouest pour rejoindre le fsm Dakar 2011 (bénin, togo, Burkina, mali, Sénégal) janvier-février 2011Participation au fSM Dakar 2011 ( assemblée mondiale des habitants) Participation au fsm Tunis 2013 ( assemblée mondiale des habitants) et forum land sur le droit au logement En direct et en ligne 1 -EN Give testimony or views about WSF - FR donner témoignages ou vues sur le FSM Very good! / Très bien! ""Mouvements sociaux et mouvements associatifs"" quelles stratégies à la lumière des changements. 2- Forum de la société civile Africaine sur la migration,et le développement et les droits de l'homme. "" Vers une voix unifiée de la societé civile Africaine""Accra Ghana du 12 au 14 septembre 2012; 3- 2ème Forum Social Maghrébin des Migrants Forum préparatoire au Forum Social Mondial 2013 à Tunis. ""Organisation de la seconde édition du forum thématique sur l'immigration les 5,6,et 7 octobre 2012 A Oujda au Maroc..
17-8/15/2014 19:36:59 Je serai à ottawa , participant au forum social des peuples OUI SUR PLACE je visiterai le cafe a Ottawa et participerai directement sur place RACHID,Maroc, AR Arabic communication possible, FR Communication possible en francais "forum social des droits de l'homme a nante 2014 Speaker forume social mondial en tunisie comme participant en 2013 " 21 22 23 24 1 -EN Give testimony or views about WSF - FR donner témoignages ou vues sur le FSM, 2 - EN Ask questions, look for information about WSF - (see time difference) FR Poser des questions, chercher des informations sur le FSM, 3 - EN Just be around and read, listen , watch - FR etre juste là : lire écouter regarder ,4 - EN Help operation of the WSF café Ottawa - FR aider à faire tourner le café à Ottawa OTTAWA LOGISTICS : public address system, power supply, tables, paper copies of WSF documentation .. Very good! / Très bien! Office Tel: +255-769-112-717 " EN English communication possible, Kiswahili I am a member of Africa Social Forum Council since 2006, and in several cases attended the WSF in Addis Ababa, Nairobi and Dakar. I have been always stand in water and agriculture chapter and has presented several papers on water rights, water and agriculture, tariif and water as basic need etc. August 24 at 10 am (see time difference) 1 -EN Give testimony or views about WSF - FR donner témoignages ou vues sur le FSM "FINANCIAL SUSTAINABILITY/TARIFFS Water"" means all water flowing over the surface of the ground or contained in or flowing in or from a spring or stream of natural lake or swamp or in or beneath a watercourse and all water made available from subterranean sources by means of works. But does not include any tidal water nor water which is used solely for the purpose of extracting minerals there from (Water Act 1981, Tanzania). The diminishing ratio of community /public cost sharing in provision of water services is recommended. There are different valid methods to compare and adopt water tariff levels. The highest water and wastewater tariff in the world is found in Scotland while the lowest water tariff in the world is found in Ireland, where residential water is provided for free, followed by Cuba with a water tariff equivalent to and no wastewater tariff. Why this does not happen to Tanzania, the country of rich water bounties? Our motto is to see all communities get water in affordable reliable and sustainable manner. REMOTE SKYPE HOST : run a chat room with several participants and be in contact with OTTAWA SKYPE GUESTS, type some interpretation, This will simply expalined after developing details of the given opportunity. For the time being, it stands as a proposal and may be developed further if requested, But we have several CDs that could be shared globally. Very good! / Très bien! 22-8/17/2014 9:26:53 I will not be in Ottawa, and may find a moment to connect on skype Yes I MAY : I make (as of now) contact with skype user “wsfcafefsm.ottawa” and MAY PARTICIPATE in the café on line (written chat, call ... ) Mikael Finland , EN English communication possible, FR Communication possible en francais Have participated in several WSF-events, wish to continue... would like to be back to you on when, but how? well, amybe i can edit these responses later... 2 - EN Ask questions, look for information about WSF - FR Poser des questions, chercher des informations sur le FSM I am looking forward to participating in the Tunis WSF 2015, and to participate there in a workshop -- and its preparations -- on "Peace and the internet" as a continuation to the workshop on the same subject in Sarajevo, June 2014. 23-8/17/2014 15:05:59 I WILL NOT BE IN OTTAWA Yes DIRECT: I will visit or participate in the cafe directly in Ottawa abdulazeez known abas syria AR Arabic communication possible, EN English communication possible tunis 2013 direct 1 -EN Give testimony or views about WSF - FR donner témoignages ou vues sur le FSM, 2 - EN Ask questions, look for information about WSF - FR Poser des questions, chercher des informations sur le FSM Very good! / Très bien! 24- 8/18/2014 8:47:30 I will be in Ottawa, participating in people social forum there No , but I want to be kept informed about what happened in wsf café Ottawa during those days Fred Zambia, lusaka EN English communication possible Local on 12th October 2012 the Zambia social forum was to look at Gender Based Violence,Child rights and Abuses. Thematic was HIV/AIDS and health Directly/online 1 -EN Give testimony or views about WSF - FR donner témoignages ou vues sur le FSM, 2 - EN Ask questions, look for information about WSF - FR Poser des questions, chercher des informations sur le FSM Share information with other participant from different origins and countries OTTAWA DIRECT HOST : welcome people directly in Ottawa and organize table conversations in the cafe Make sure participants are safe and feel free to participate and arrange table and chairs in order. 30- 8/20/2014 15:30:17 je ne serai pas à Ottawa, et je pourrais trouver du temps pour me connecter sur skype OUI JE POURRAIS BIEN et je fais des maintenant contact avec le compte skype "wsfcafefsm.ottawa" et PARTICIPERAI PEUT ETRE en ligne dans le cafe "Olfa , Tunisie (El mourouj) AR Arabic communication possible, EN English communication possible, FR Communication possible en francais j'etais dans la comité de soutien duforum social irakien et dans la comité logistique du forum social mondial le 23 aout (voir le décalage horaire) 2 - EN Ask questions, look for information about WSF - FR Poser des questions, chercher des informations sur le FSM, 3 - EN Just be around and read, listen , watch - FR etre juste là : lire écouter regarder ... Very good! / Très bien! 34 - 8/31/2014 17:35:12 Je serai à ottawa , participant au forum social des peuples Yes DIRECT: I will visit or participate in the cafe directly in Ottawa radiha2020@yahoo.fr Ahmed , Mauritanie , Nouakchott AR Arabic communication possible je e jamais participe a un forum je veut etre avec vous dans le café en directe 2 - EN Ask questions, look for information about WSF - FR Poser des questions, chercher des informations sur le FSM comme que je suis nouveau ,je vais poser des questions pour mieux connaitre le forum se qui va mes permettre de participer activement dans les discutions et témoigne Very good! / Très bien!